Hello beautiful souls! Hope you’re enjoying the weather. I know it may have been a little gloomy with the constantly cloudy sky but let that not deter your spirits. The festive season has just begun and when I say ‘festive’ it’s celebration time for all you caring sisters out there! With Raksha Bandhan 2018 just a few weeks away, I’m sure you must already be excited about the festival and the expected shower of gifts. Your dearest brothers would never miss out on your Rakhi gift right? Keeping all the gift excitement aside, there is a deep emotional string attached to this pious festival which strengthens the bond between brothers and sisters. As the sister ties a ‘rakhi’ (religious band) on her brother’s hand, it takes their relation to a higher level, away from all the past fights and differences. It’s the day that magically bridges the gap between siblings which may have risen over time, distance or any unpleasant circumstances. This day being a culturally significant one, women take additional efforts for selecting their festive wardrobe. The dress code followed for this day usually revolves around ethnic wear like sarees, salwar suits, lehenga cholis and these days, even tunics and other fusion wear silhouettes. 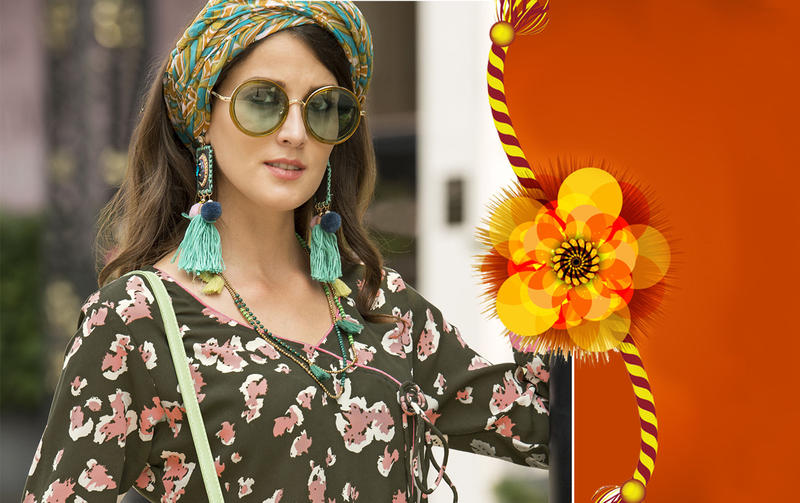 Keeping the current trends in mind, we have some smart outfit ideas for the upcoming festival of Raksha Bandhan. It’s an Indian festival after all and what could be a better outfit than a modest garment like saree! With this versatile ethnic garment, you can always play around and step out with a difference. 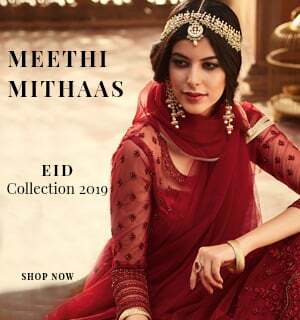 Pick a lightweight georgette or chiffon saree with colorful prints and drape it round your neck or over both your shoulders to secure it with an ornate belt. With light and printed sarees, you can easily experiment with contemporary and fusion draping styles. Quite an off-beat thing for Raksha Bandhan, but definitely worth a try! 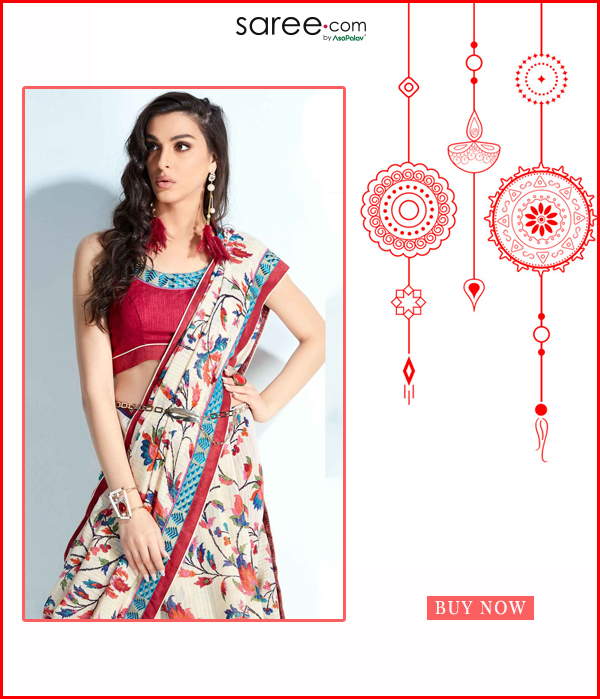 Those who have a well-defined wardrobe style and are inclined more towards traditional clothing can choose a moderately embellished silk saree or an embroidered half-and-half saree having vibrant hues. And yes, don’t forget to add some rich metal ornaments! The brightness surrounding this delightful occasion should reflect in your wardrobe too! 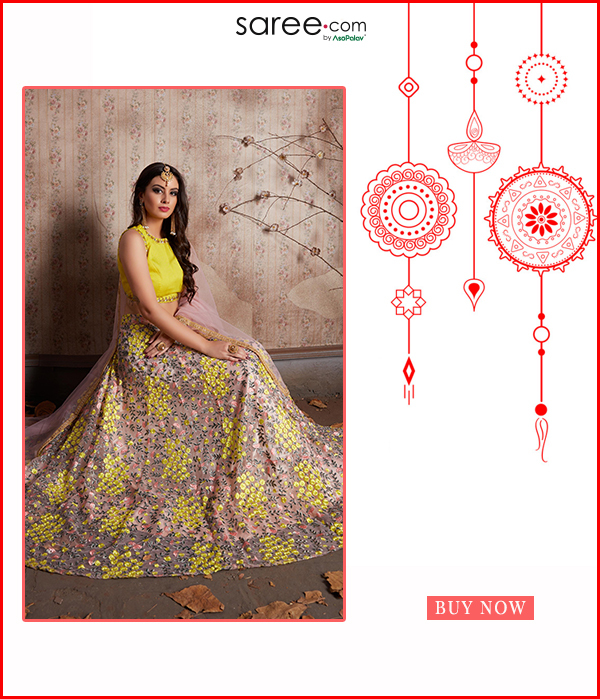 How about donning a colourful floral lehenga choli to match the cheerful mood of the occasion? Lighter hues like neutrals and pastels can be picked since the ritual of tying ‘Rakhi’ is usually celebrated during daytime. Opt for silhouettes that are dominated with prints and less of embroidery for your daytime wardrobe, you can save all that extra bling and shimmer for festivals like Diwali and Navratri that are majorly celebrated after dusk. 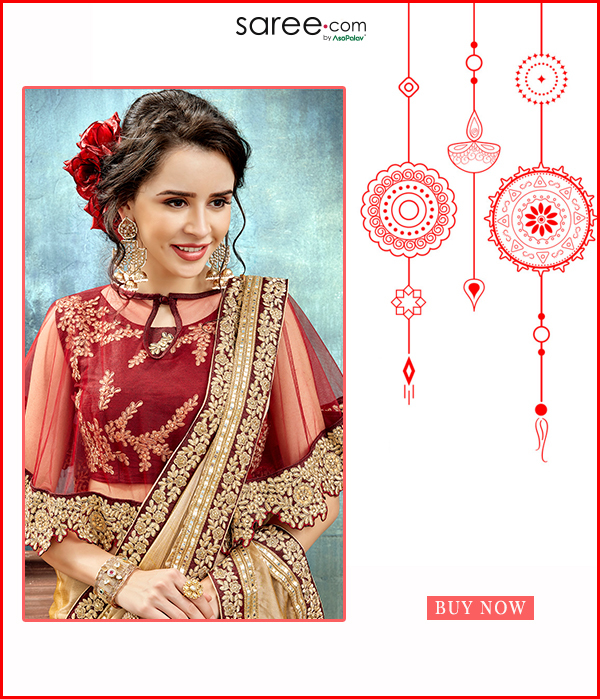 For buying the apt festive lehenga choli, fabrics like satin, satin silk, net, georgette and cotton should be on the top of your selection criteria if comfort is your priority. I don’t think we women will ever be able to get over Anarkali suits. The grandness and majestic appeal of this silhouette is definitely drool-worthy and that means that Anarkali suits are here to stay for a long time! 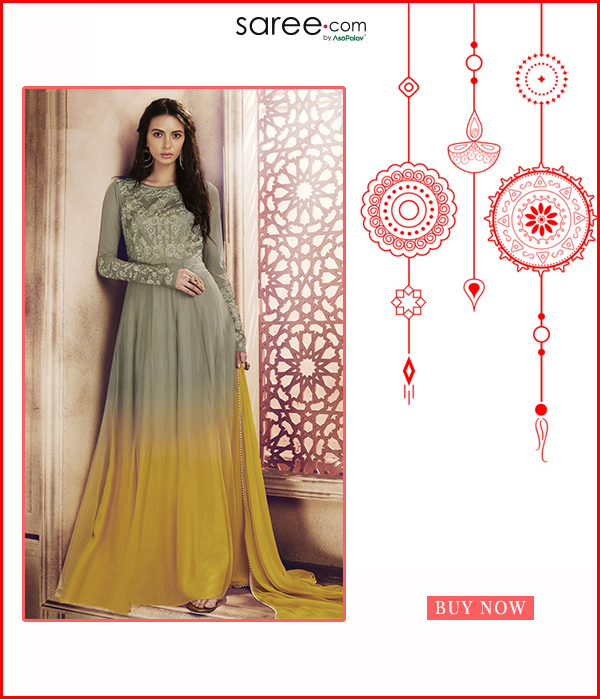 These days, floor-length Anarkali and Abaya style suits are quite in vogue. 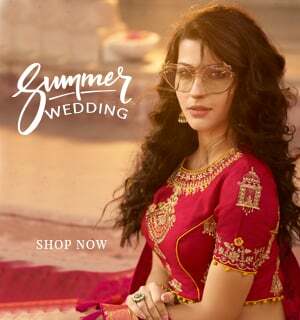 The Indian version of western style gowns, these silhouettes radiate an aura of elegance and are an absolute ‘Yes’ for a semi-formal or formal celebration of Raksha Bandhan. For a well-coordinated look, these floor length suits, especially the ones that have a plain flare should be accessorized with minimal jewellery and metallic heels. Are you not one of those who can carry off something as tedious as a saree or handle the elaborateness of a lehenga choli or Anarkali suit? Does handling the dupatta drain your mood? Indian ethnic wear has a smart solution to all of these issues! Contemporizing the top garment of salwar suits, these days, kurtis and tunics, without side slits have hit the market as independent outfits which can be worn like a complete dress. Long tunics have now become an integral part of ethnic wear and are quite pervasively accepted as the dress code for Indian occasions along with other types of Indian garments. Asymmetrical hemlines, back cut-outs, flared or cold-shoulder sleeves, collar details; your options don’t end there. There are plenty of variations in designer tunics that will leave you craving for more! Whether it’s a huge family gathering or a quiet Rakhi ritual followed at home, showing off your fashion skills never hurts! Following the trend of layering, add a jacket, scarf or poncho to your tunic, lehenga or salwar suit. If mix-and-match is not your thing, then you can pick a readymade jacket suit or a saree with poncho blouse to be a part of the style tribe without putting in much effort. From subtle and elegant to vibrant and quirky, layering allows endless wardrobe innovations. For Raksha Bandhan this year, go twinning with your dear brother by adding coordinated layers over your plain outfits! It’s time to go around with a little fusion! 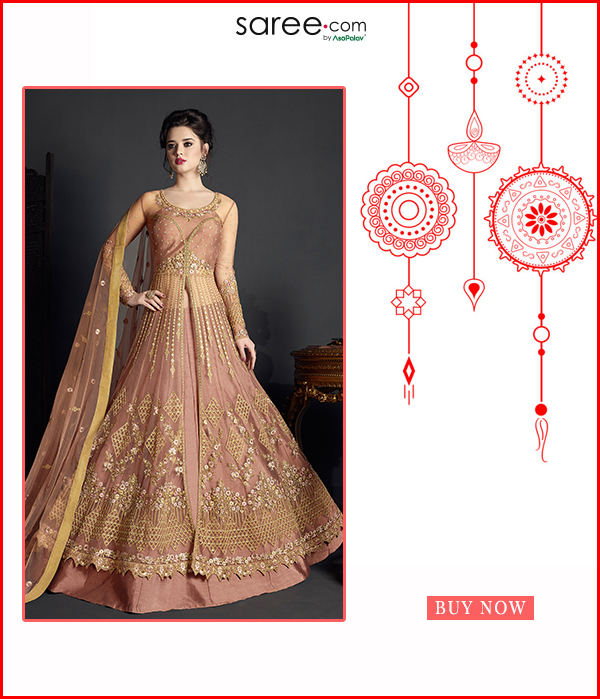 A trendy indo-western lehenga suit will make a smart pick for your Rakhi celebrations this year. These silhouettes are relatively new and are fast catching up with ethnic fashionistas all over the world. Bright shades of pink, yellow, green, blue or softer ones like mauve, grey as well as muted tones will bring out the cheerful feel of this pious occasion. 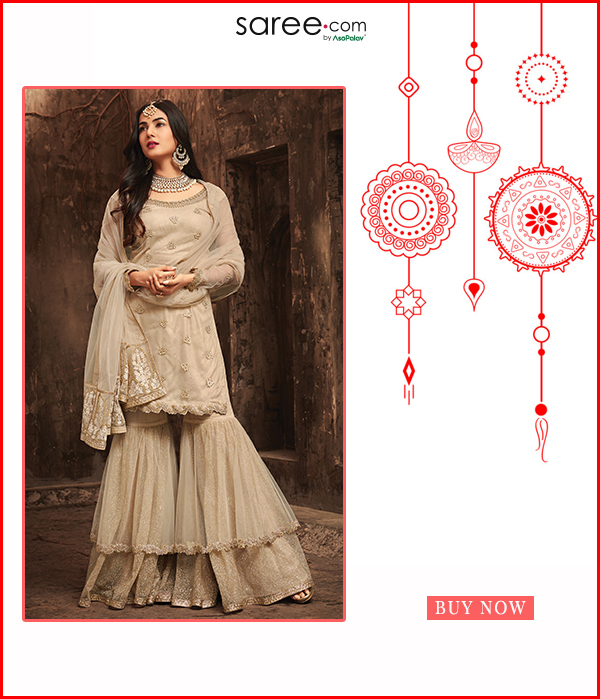 Be smartly decked-up as you walk in for a festive party or step ahead to receive your guests! A heavy palazzo suit or an embroidered sharara suit will stylishly match up with the mood of a formal family gathering or a cultural lunch treat. A few pieces of ethnic jewellery and a statement hair accessory to go with it and you’ll be moving around like an Indi-fashion goddess! How to Keep Shining During Wet Monsoons? Your Wedding Dream Dress straight from your Stars! What to wear for an upscale poolside Engagement Party?